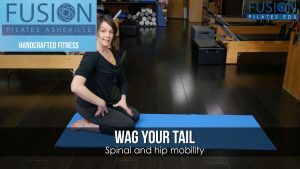 Join Amy Dowling from Fusion Pilates Asheville for a quick Pilates tip on spinal mobility. Join Amy Dowling from Fusion Pilates Asheville for a quick Pilates tip on dynamic balance. 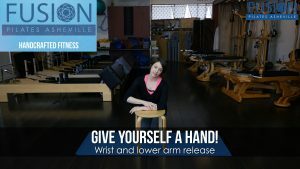 Join Amy Dowling from Fusion Pilates Asheville for a quick Pilates tip on tuning up our inner suspension system. Balancing Act: Balancing on tennis/spikey balls. 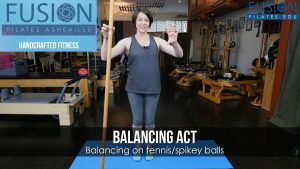 Join Amy Dowling from Fusion Pilates Asheville for a quick Pilates tip on using small balls to promote better intrinsic and extrensic balance of the muscles of the foot and lower leg. Do you want to work with this instructor? Call us at 828.333.4611 or email us. Join Fusion Pilates Asheville’s Amy Dowling for some tips on an easy release for the quadratus lumborum.